Broan Model BPS1FA36 Range Hood Filter - 11-3/4" X 17-1/4" X 3/8"
Broan Range Hood Filter BPS1FA36 - 11-3/4 X 17-1/4 X 3/8 - Fits Broan Allure QS1, NuTone Allure WS1, Sears 5270 - 36 series Includes center mount pull tab on long side of filter for easy removal Replaces Broan, Nutone part number 99010300E Also replaces GE # WB02X10706, WB02X10710This is a geniune OEMÂ Broan-Nutone Part Attributes: Contains an aluminum foil pad between two pieces of expanded aluminum. 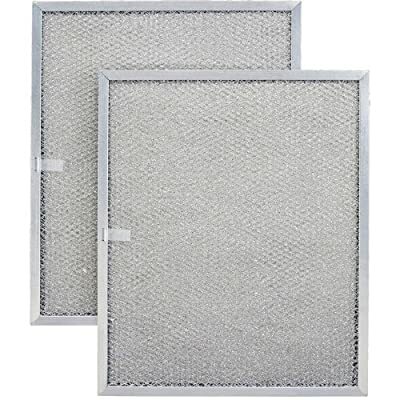 Usage: This washable aluminum filter is used in ducted and ductless range hoods and microwave ovens to remove grease from the air. Maintenance: We recommend that the filter be washed as often as required to prevent grease build upÂ and a resultant decrease in air flow. Soak in a solution of hot water and degreaser for 10-20 minutes. Agitate gently to remove loosened grease. AÂ residue of grease on the filter after washing is acceptable as this helps retain grease. Made in the USA by All-Filters, Inc.